Leikkaan kortit : #404 Allsorts Metal! Hauskaa lauantaita, tervetuloa viikon Allsorts haasteen pariin! Metallia pitäisi löytyä viikon työstä! Mallikorttini on remppamiehelle ja ruuvit on ainakin tallessa! Hi; Happy Saturday, it's time for a new Allsorts Challenge! This week's theme is "Metal" ! My working man- card has screws near! Two tools charms included too. a piece of kraft embossed in a folder of technical details. Charms, screws, jewellery ribbon. Congrats! Please contact me (leikkaan@gmail.com) to collect the prize. A real fun card for the boys Mervi and fits the theme perfectly. Cute image and fun metal bits to go with it, a perfect card for a handyman! Wonderful masculine card, Mervi! I love that bear and the tool trinkets. Thanks for joining us this week at Watercooler Wednesday Challenges. Super cute masculine card Mervi. Love that little pig and his tools. Great job! Thanks so much for joining us at the Watercooler Wednesday Masculine Challenge this week (WWC107). 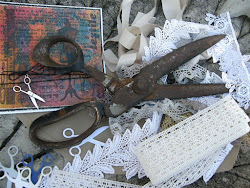 This is so cute Mervi, love those little metal tools! 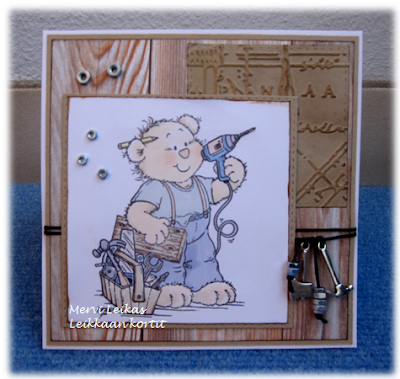 This is a fabulous card Mervi, great image and love those tools. What a fun card, Mervi. The cute little bear with all those tools would appeal to any young boy or older "boy at heart". This is an adorable take on our masculine challenge. Your colouring is great and those little metal embellishments finish the card off perfectly. Thanks so much for joining our Watercooler Wednesday Challenge this week. What a gorgeous design for a male card! Love the idea! Thank you so much for playing along at Penny's Challenges. Fabulous creation, love your charms. I love how you made this card. Lots of elements, but still perfect to give to that Handyman in your life. Thanks for joining us on Watercooler Wednesday and sharing your card with us. That is one busy little bear! Very cute. Love all the little details you've included. Thanks for joining the Watercooler Wednesday Challenge. Fub masculine card, thanks for joining us at Watercooler Wednesday Challenge.